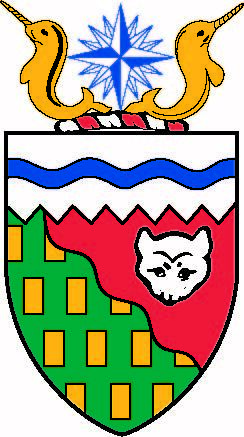 The seal of the Northwest Territories (NWT) consists of the coat of arms of the NWT encircled by the words "The Seal of the Northwest Territories." The Government of Canada approved the seal on November 29, 1956, following the adoption of the coat of arms. From 1869 until 1956, the Great Seal of the Northwest Territories had consisted of the Royal Arms with the words, "The Seal of the Northwest Territories." The coat of arms (or armorial bearings) of the NWT was approved by Her Majesty Queen Elizabeth II on February 24, 1956. The coat of arms consists of two gold narwhals guarding a compass rose, symbolic of the magnetic North Pole. The white upper third of the crest represents the polar ice pack and is crossed by a wavy blue line symbolizing the Northwest Passage. The diagonal line separating the red and green segments of the lower part of the shield reflects the treeline. The green symbolizes the forested areas south of the treeline, while the red represents the tundra to the north. Minerals and fur, important bases of northern wealth, are represented by gold billets in the green section and the mask of the white fox in the red. The territorial bird is the gyrfalcon (Falco rusticolus). It became the official bird of the Northwest Territories in 1990. The gyrfalcon is the largest and most magnificent of the falcons and breeds throughout the tundra, including all the Arctic islands. Gyrfalcons usually winter in the North and during that season can be found anywhere in the Northwest Territories. They range in color from white through shades of grey and brown to almost black. Darker birds are more common in the NWT. 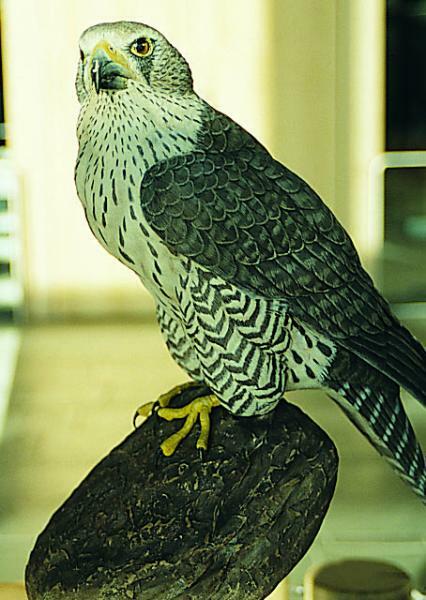 Gyrfalcons eat mostly ptarmigan, but also ground squirrels, seabirds, waterfowl, and arctic hares. They are expert hunters, and extremely fast and powerful fliers. The mineral emblem is gold. 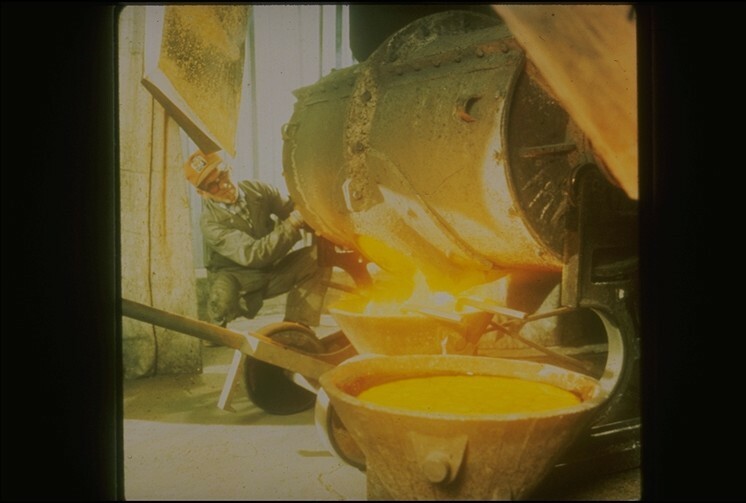 Gold has played a major role in the development and prosperity of the Northwest Territories. In May 1981, gold was proclaimed the mineral emblem, symbolizing the enduring value of wealth and the bright prospects and future of the Northwest Territories. The flag was adopted by the Council of the Northwest Territories in January 1969. The design incorporates the territorial shield on a white centre with blue sections on each end. The blue panels represent the NWT lakes and waters. The white centre panel, equal in width to the two blue panels combined, symbolizes the ice and snow of the North. The design was the result of a nation-wide competition submitted to the Flag Committee of the Territorial Council. 17-year-old Robert Bessant of Margaret, Manitoba designed the winning entry. 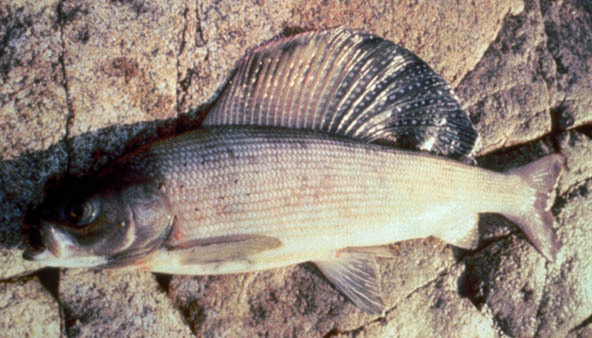 The official fish of the Northwest Territories is the Arctic grayling (Thymallus arcticus). The Arctic grayling, a fish that can be found in a broad range of habitats in the NWT and has the ability to live in the harshest environments, was named the official fish of the NWT on September 9, 1999. 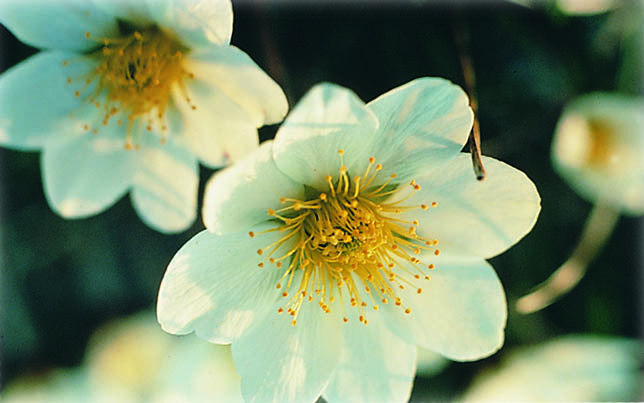 The floral emblem is the mountain avens, which as adopted by the Council of the Northwest Territories when it enacted the Floral Emblem Ordinance in June 1957. The mountain avens (Dryas octopetala) has narrow basal leaves and supports a single white and yellow flower on a short stem. This member of the rose family grows abundantly in the eastern and central Arctic, as well as in parts of the Mackenzie region. It is found in open and well-drained areas, especially on high or rocky ground. The tartan of the Northwest Territories includes many of the colors of the North: the white of the snow; the green of the forests; the yellow of the birches in fall; the red of the tundra; and the blue of the lakes, rivers and oceans. The idea of the tartan was proposed by Janet Anderson-Thomson, a long-time resident of the Northwest Territories and of Yellowknife. Upon her suggestion, research was carried out and an original design was developed and produced by the firm of Hugh MacPherson (Scotland) Limited of Edinburgh, the leading designer of tartans in the world. The tartan is registered at the Court of the Lord Lyon, King of Arms of Scotland, and anyone may wear it. NWT's territorial tree is the tamarack (Larix laricina),a small- to medium-sized tree that reaches heights from six to fifteen metres. 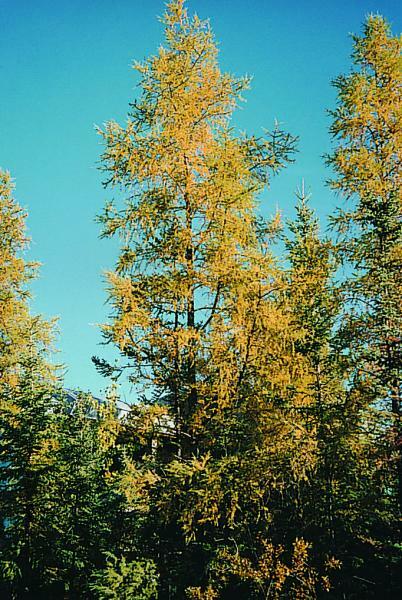 The tamarack, found throughout the NWT, was named the official tree on September 9, 1999, replacing the jack pine. In the NWT the tamarack is used for posts, poles, and firewood. The official gemstone of the Northwest Territories is the diamond. The diamond was adopted as the official gemstone on September 9, 1999, to recognize that the NWT is home to Canada's first diamond mine.